Sangiovese, Nebbiolo, Barbera, Nero d’Avola are all well-known and much loved Italian grape varieties. But did you know that Italy actually has over 700 (!) indigenous grape varieties? Yes, that’s a lot to taste through. I’m thrilled to report that I at least made a start by getting introduced to Susumaniello, an ancient grape native to Puglia region, the “heel” of Italy. 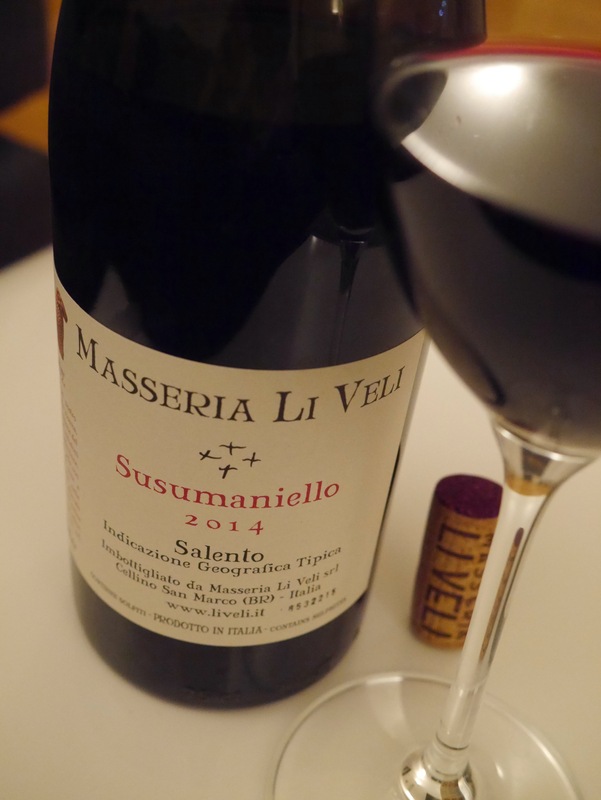 The Li Veli estate in Puglia has launched a project of rediscovery of the almost extinct grape varieties – Susumaniello being one of them – by making 100% single varietal wines. I was fortunate to get my fingers on a bottle of their 2014 vintage thanks to Armit Wines, a London based wine merchant specialising in Italian wines. I decided to dish up a nice homemade dinner to accompany the wine. 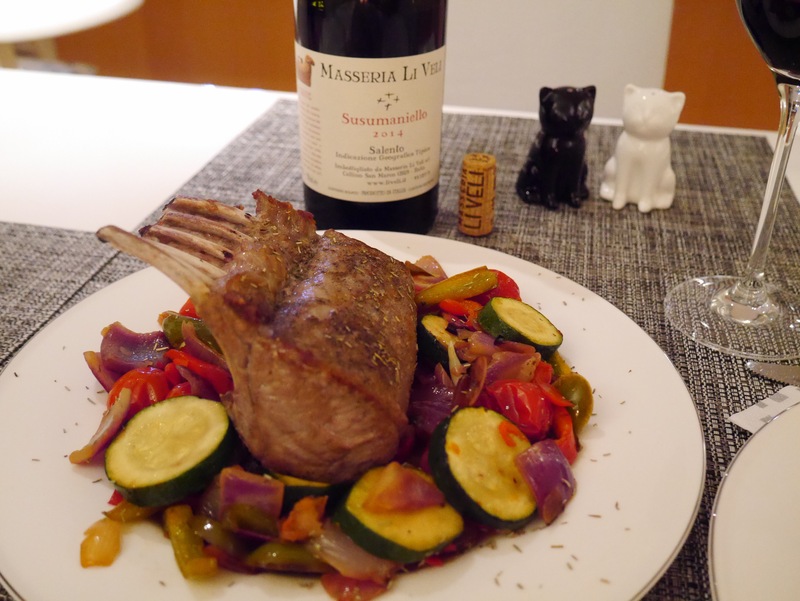 Having done a bit of research on the best foods to match this intriguingly sounding grape, I was happy to discover that it goes well with my favorite meat – lamb! And indeed, it turned out to be an excellent pairing. 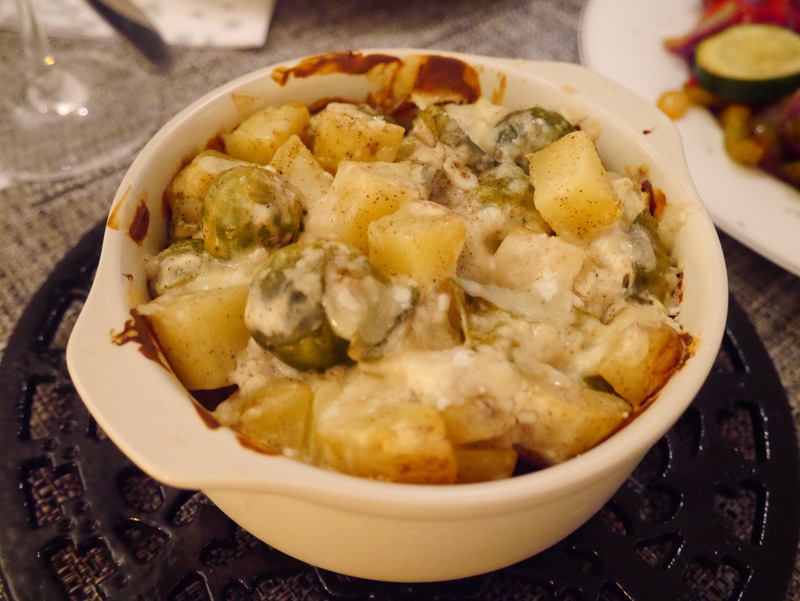 I chose to make a rack of lamb with mixed vegetables and a Brussels sprout and potato bake with cream cheese and parmigiano shavings to add a hint of Christmas spirit to the whole venture. Tasting note: Medium+ intensity on the nose, aromas of black cherry, vanilla, toast, blackberries, licorice, leather, black pepper; earthy; there is a freshness element to it… reminds me of …spring forest? Full bodied palate, soft ripe tannins, a hint of sweetness at the start but absolutely dry finish. The aromas on the nose mirror those on the palate. Nice and long finish. The slight sweetness element I mentioned makes this wine pair wonderfully with sweeter elements in your food. In my case it was the red onions in the roasted vegetable mix. I imagine it would be lovely with cranberry sauce accompanying your Christmas dishes as well. This wine is impressive on so many levels. In the unlikely case you have some left in the bottle after dinner you’d want to finish it on its own, curled up in front of a fireplace, wrapped up in a warm blanket. If you would like the recipe to either my lamb, veg or the bake, please shout! Leave me a comment at the bottom of this post or drop me an email via the contact page. Previous PostExploring the Ornellaia Winery – My Ultimate Supertuscan ExperienceNext PostARE YOU DREAMING OF A WINE CHRISTMAS?